How to draw palm trees must be an intriguing topic for you, if you love tropical beaches. Why do I know it?...because I love tropical beaches too. Can you picture a tropical beach without palm trees? In our modern realm, palm trees, especially coconut palms symbolize luxury, tropical paradise, sea, beaches and sun. 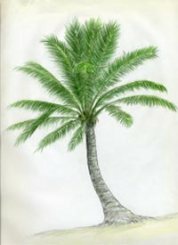 Palm branches were also the symbol of triumph and victory in the past. People of Jerusalem celebrated Jesus with palm tree branches when he entered the town. 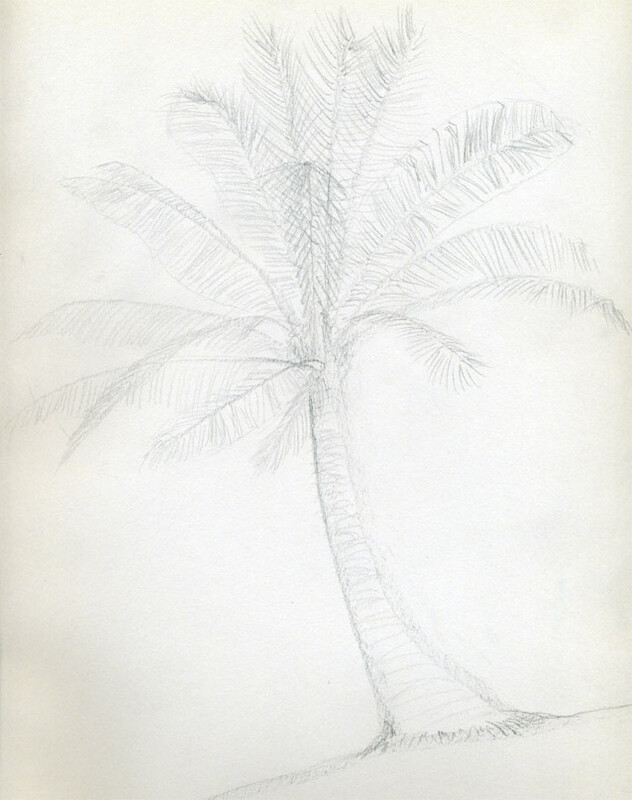 Palm trees are great objects for drawing. 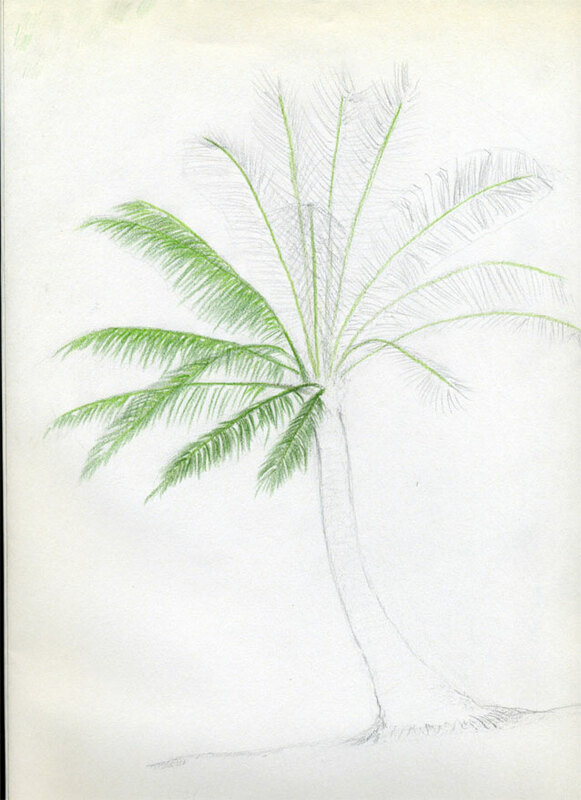 I would say, to draw palm trees requires almost no skill. They are very simple in shapes if you are comparing them to other trees. 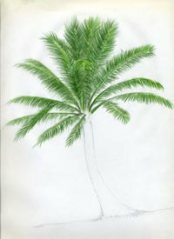 Think of a palm tree as only a giant piece of grass – a kind of prehistoric. 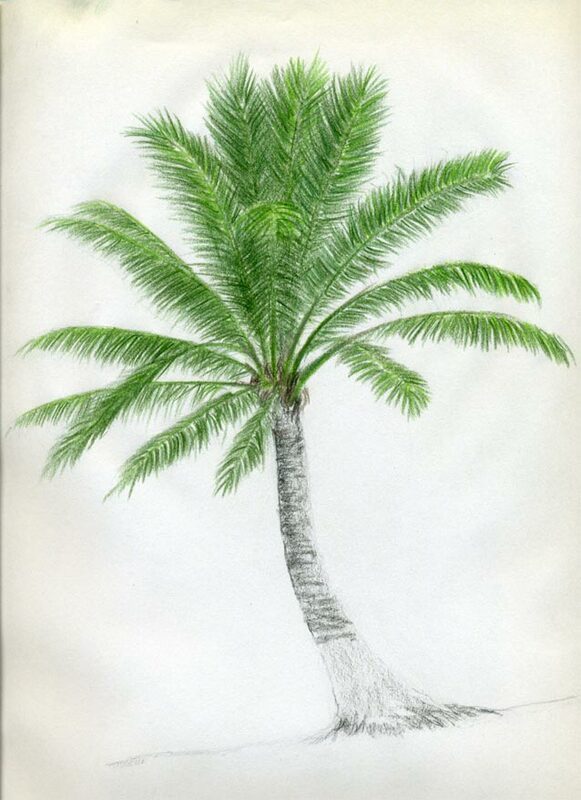 I made this palm tree drawing as detailed as possible. However, you can draw a palm tree much quicker and have it finished in less than 5 minutes. 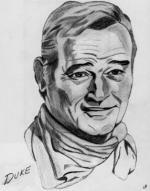 I would suggest starting to draw with a standard HB pencil. Begin from the ground. Sketch the stem (trunk). Hold your pencil tilted or loose grip. Always remember, in the beginning draw only weak and gentle pencil lines so that you can erase them anytime later during the process. First pencil lines are always only the guidelines. 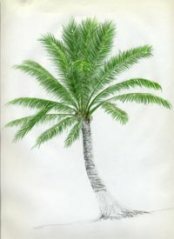 These basic rules or techniques apply not only when you draw palm trees but virtually for anything. When you have the trunk ready outline the branches. Try to sketch the branches possibly by one single pencil line each if you can. It’ll be a great exercise. Observe carefully how each branch grows out from the top of the stem. 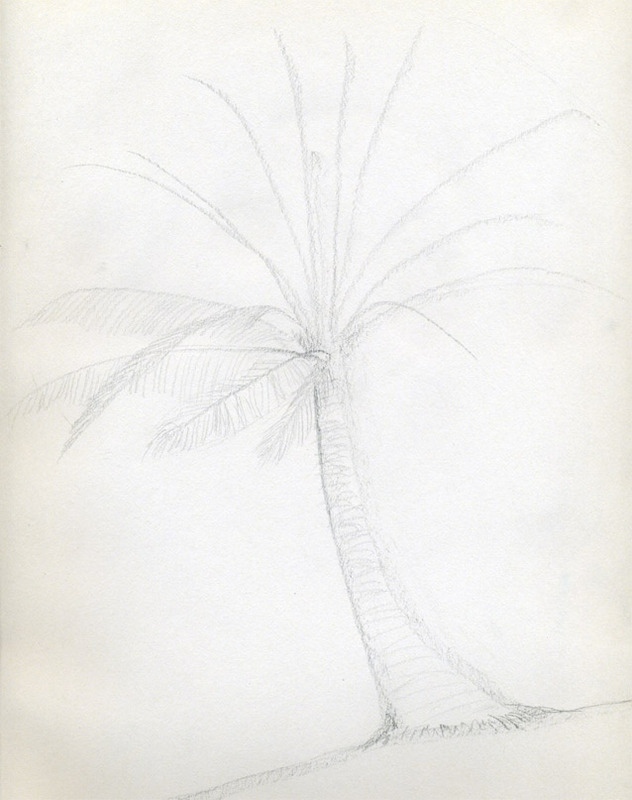 This is a wild palm growing somewhere on a beach - not a palm in arboretum. 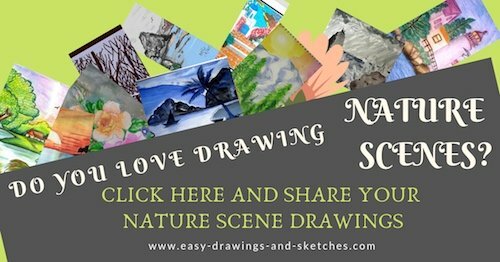 Draw the leaves. Notice that every palm tree branch has green leaves on two opposite sides on each branch. Sometimes you see all leaves and sometimes not. Sometimes the leaves cover each other or are broken, etc. 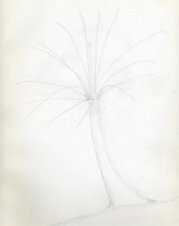 Draw weak pencil contours of leafed-branches as if they were ready. This will give you an idea about the final shape of the branch when it is filled with leaves. 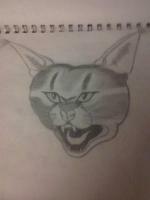 Click on the picture and see how I sketched the approximate outlines. Good. 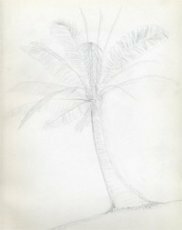 Now you should have a complete basic outline of a palm tree. You can consider this as a kind of coloring page too because that is what we are going to do next. We won’t erase pencil lines this time. 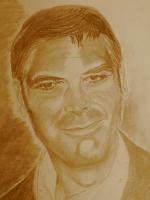 Simply continue drawing by color pencils. 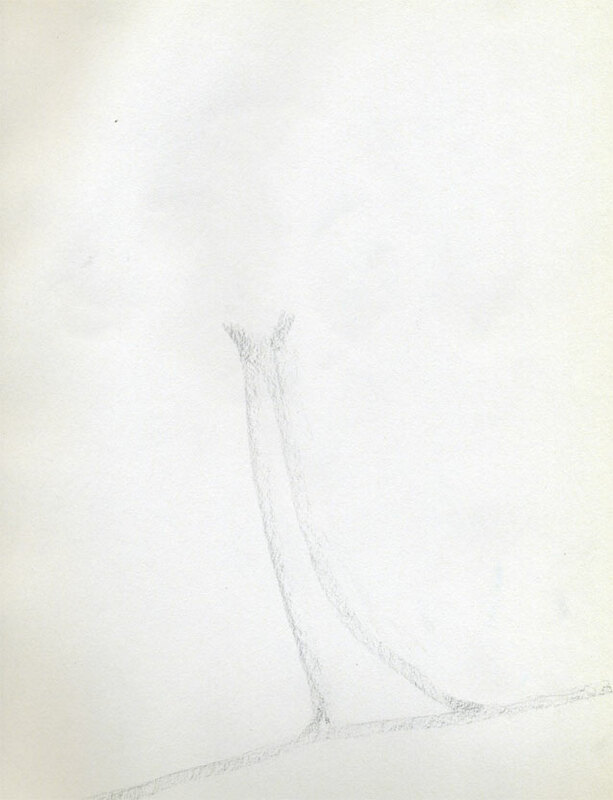 Color pencils will cover most of the initial graphite pencil guidelines. Notice that I made the stem slightly curved right under the top. Now, the coloring. Experiment here a little with your own drawing. Play with it. Try new ideas. First, use the brightest one – Yellow Green and just gently draw the branches. 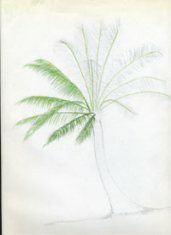 You can also start to draw the leaves. 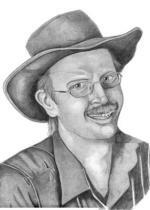 If you are not sure then by all means test your color pencils on a separate paper. Just play with it and I can guarantee that you’ll get the best idea instantly. 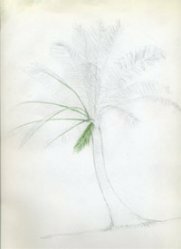 When you draw palm trees it is good to have handy 3 different green color tone pencils. Gradually draw the leaves on every branch. Observe the spots where the leaves are brighter because of the direct daylight. Usually the leaves in more dense and clustered areas appear to be darker. 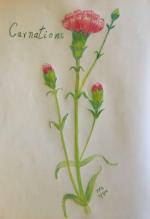 In those areas use darker green color pencil. Shading the stem. Notice that there are ring-like broken circles around the stem. Those are kind of residues from the branches that finally formed a hard stem as they grew. You can add some color to the ground too. The most suitable would be a beach sand color, what do you think?